It's really hard to see when there's a bucket over your head. 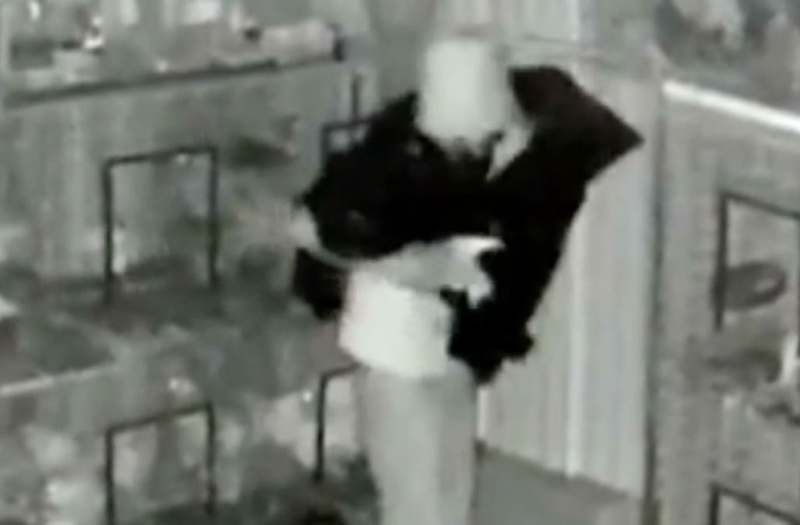 Surveillance video captured a hapless burglar grabbing expensive racing pigeons while wearing a pail over his face in an apparent attempt to elude surveillance cameras at a Florida store. The man is seen reeling around cages, pulling out birds and stuffing them in a box. He climbs a ladder leaning against a high fence, drops the birds to the ground, then falls off the ladder, the video shows. "He's just like a lazy guy. Stupid, you know?" Nelson Hernandez, owner of El Viejo Lazaro Botanica in Miami, told InsideEdition.com Tuesday. Hernandez runs a religious icon business and also buys and sells racing pigeons. He says the birds can cost as much as $1,000 each. It's not the first time his store has been hit. "This is the second time in six months," he said. The first burglar was caught by police and is now in jail, Hernandez said. The newest thief is not someone he recognizes, he said. If he keeps getting broken into, Hernandez says, "I lose everything."